Later in the movie, Gibbons confronts another co-worker about playing the radio too loud in his cubicle, which is affecting Gibbons’ mood at the company. These two examples are played for laughs, but it highlights some very real issues that many in the corporate world have with office noise – distractions from people’s voice that cut into employees’ productivity and focus. 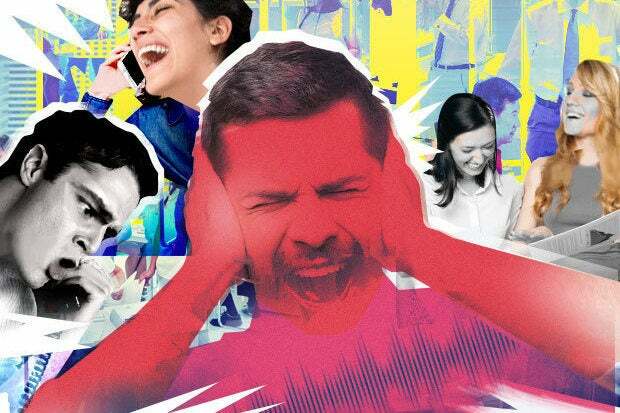 As companies move away from the typical office-and-cubicle layout, in an attempt to foster more collaboration between employees and co-workers, the office noise distraction becomes even greater. With no walls, carpets and ceiling tiles to block sound, the office of tomorrow may resemble more of a high school lunchroom than a library. Fortunately, companies are coming up with technology solutions as a way to help reduce these distractions: Sound masking, headphones and new office “quiet area” concepts are entering the equation. “I think we’re seeing in the mainstream a pushback in the shift to the open office space,” says David Sholkovitz, Director of Marketing at Cambridge Sound Management. “Employees are finally getting frustrated with this … people are not so happy with their new space that their company just built for them.” The lack of of sound privacy is often cited as the biggest complaint when it comes to employee morale – a 2013 study from the University of Sydney showed that sound privacy dissatisfaction outranked other annoyances, including temperature, air quality, cleanliness and furniture comfort. To combat the noise, Waltham, Mass.-based Cambridge Sound Management has developed sound masking technology that doesn’t cancel the noise (like a noise-cancellation headset), but rather diffuses it, so that the human ear doesn’t focus on another person’s voice. To put it another way, the technology helps create an effect that from a distance, people talking sound a little bit like the adults in the old Charlie Brown / Peanuts specials. The company makes small emitters that can be installed into the ceiling (or hung down on a wire for offices that have eliminated ceiling tiles), which connect to a centralized controller that can be placed along with other networking gear. The emitters then produce a sound, creating sound waves that then mask the noise of conversations. It sounds a lot like a white noise machine or an air conditioner, but spread out across an entire office floor, rather than in just one location. 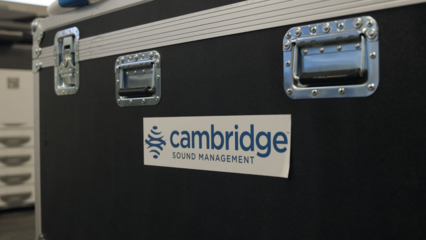 Sound Masking in 17 Seconds from Cambridge Sound Management on Vimeo. The company recently announced emitters that have a speaker in them, to allow for paging-like messages to travel through the emitters instead of having a separate paging system. This is beneficial for workplaces such as hospitals or doctor’s offices, where sound privacy is even more important to help protect a patient’s data. For employees who work in locations where sound masking isn’t deployed, they usually turn to a trusty pair of headphones to help reduce distractions. One of the latest models is the Sennheiser MB 660 ($449), which utilizes new active noise-cancellation technology that adapts to the volume level of the outside noise The new wireless headphones are not just for listening to music while working (which many employees use as white noise to keep focused), but they also incorporate unified communications functions for making conference calls via Skype or Webex. There are three cool features of the headset worth mentioning. The NoiseGard feature is “constantly monitoring your background environment for noise,” adjusting the level of noise reduction inside the headset. If things are quiet, there’s less ANC. If Chatty McYakker starts singing next to you, the ANC kicks it up a few notches. Second, the headset has a “TalkThrough” feature that turns off the ANC (and, assuming, the music) to let you hear your colleagues – so you don’t have to point at your head or take the headset off when your boss comes over asking about the cover sheet for the TPS reports. Third, the Own-Voice-Detector monitors the environment for the user’s own voice – when it’s detected, the headset “reacts immediately to provide optimal speech intelligibility while at the same time reducing disturbing background noise.” In other words, you can then respond to your colleague’s request without sounding like you’re yelling. The project, known as “Transformable Meeting Spaces”, create an alternative to open office concepts and individual offices and conference rooms. Using both woven and “transformable materials”, the meeting spaces can expand and contract to create a room to hold between six and eight people. The project is part of the Self Assembly Lab at MIT, and you can see additional pictures at the MIT site. I’m not sure yet whether this concept is ready for prime time – it does feel goofy to be standing inside one of these things, and it seems to be more aimed at creating a temporary conference room than something that could reduce noise. One thing is clear, though – we have to get better at tolerating our co-workers. Especially when there’s cake.